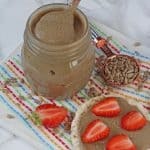 This Sunflower Seed Butter is so easy to make and is a great nut-free alternative to peanut butter and can replace it in many recipes. Place the sunflower seeds into a large pan or wok on the hob and dry-fry for a few minutes until they have toasted. Be careful not to burn the seeds though! Transfer the seeds into the blender. Add the melted coconut oil and blitz on a low setting until smooth. This will probably take about 5 minutes in total and you can do it in stages and stop for a little while if you are worried about the blender over-heating. When the sunflower seed butter has reached a good consistency add the honey, vanilla extract and sea salt and blitz one final time. Store the sunflower butter in an airtight container in the fridge for up to 1 month.